1) Keep it all white. White reflects light best, making the kitchen space look bigger. Paint the countertops and cabinetry in white so that it will look seamless with the walls and ceilings. For some depth and shadows, use recessed-panel cabinets with crown moldings. 2) Keep color contrasts in the same color value. If you do have to add some color, maintain similar hues of the color scheme. This way, the sudden "pop" of color won't let the eyes see the shifts and breaks in the room. Like white, using similar hues can bring an expansive effect. 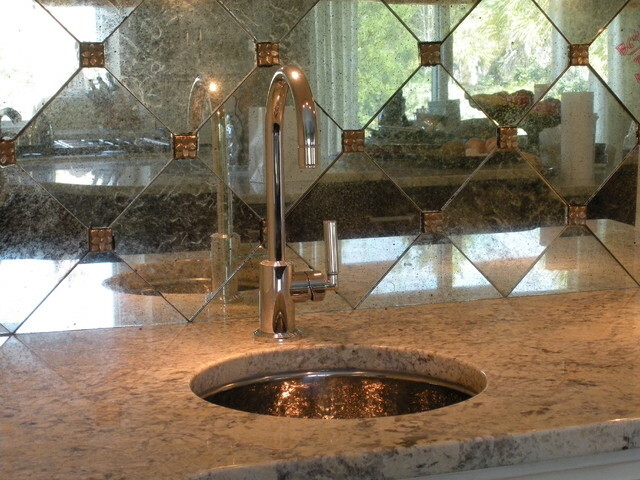 3) Go for a mirrored backsplash. 4) Use glass doors for your cabinets. Glass cabinet doors gives the room depth, as the walls can be seen through it. The challenge is to make sure to keep the cabinets orderly and, if possible, color-coordinated. 5) Have an open shelf. If glass cabinets aren't your thing, perhaps having open shelves is better. Aside from creating an illusion of space, it also feels warmer and more welcoming. "Open shelves invite visitors to feel at home and help themselves to whatever they need. They don't have to ask where things are, or go rummaging through cabinets because it's all in plain view," said homeowner Jamie, according to Good Housekeeping. 6) Flood the space with lights. Use little window treatments so that natural light is not blocked off. Add additional lighting fixtures on walls, backsplashes and countertops to open up the space. Pick counter or bar chairs that have slim legs, or if you have a working table to use as an island, it should be long and narrow with clean lines. Ditch furnishings with thick bases, as they will make the room visually bulky.